Two types of orchestra have flourished at the University of Toronto, fulfilling two different functions. There have been recreational orchestras, whose primary aim is to give the participants an enjoyable outlet for their musical talents. These groups are populated with players from the wider university community and concentrate on the most popular standard repertoire works; their main goal is the enjoyment of sociable music making rather than professional training. On the other hand, orchestras made up solely or mostly of university music students aim for the highest performance standards, offer valuable training to aspiring young musicians, and in addition to the standard repertoire often perform quite demanding works, including contemporary repertoire and new music. One characteristic feature of student orchestras is the high turnover rate. The graduating class leaves the orchestra each year, resulting in the departure of about one quarter of the players each season. This is one reason that a university ensemble can never quite reach the standards of a top quality professional orchestra, in which musicians typically play together for many years, with a much lower turnover rate. But it also gives a freshness to the student orchestra that more polished groups may lack; many of the young musicians are performing difficult but rewarding orchestral repertoire for the very first time, with all of the excitement and enthusiasm that brings. The University of Toronto has been home to many recreational and training orchestras over the years, both preceding and following the creation of the Faculty of Music in 1918. 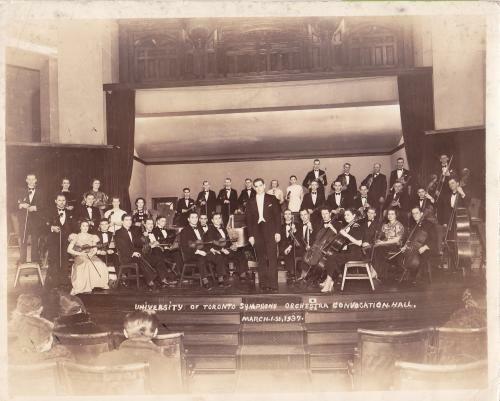 The earliest orchestra loosely associated with the University of Toronto was the Toronto Orchestral School, which began rehearsals in 1891 under the aegis of the Toronto College of Music. The College had been founded in 1888 by F.H. Torrington (1837-1917); two years later it became the first music school affiliated with the University of Toronto. Torrington was born in England and arrived in Toronto in 1873. He was an organist and violinist, and also conducted a series of local choirs and orchestras, contributing greatly to the development of the city’s concert life. The Toronto Orchestral School rehearsed on Monday evenings during the academic term under Torrington’s direction, and gave at least one public concert each year. In June 1894 it performed during one of the five concerts celebrating the opening of Massey Hall. At its height it was a 100-piece orchestra, with a few teachers added to the ranks to help out the students. No record of its activities beyond 1900 has been found. In 1896 a rival institution, the Toronto Conservatory of Music, became the second music school to be affiliated with the University of Toronto. In 1906 the Conservatory hired Frank Welsman (1873-1952) to organize an orchestra. He was a Toronto-born pianist and conductor who had studied music locally and at the Leipzig Conservatory. On April 11, 1907 his 50-piece Conservatory Symphony Orchestra debuted at Massey Hall. The orchestra consisted of students, teachers, and community members, including professional musicians brought in to assist the less experienced players. After two years of improving standards, the orchestra dropped its official association with the Conservatory and was renamed the Toronto Symphony Orchestra (TSO). The Welsman TSO flourished for ten years or so but fell victim to the First World War. It ceased operations in 1918, the same year that the University of Toronto created the Faculty of Music. When the composer John Weinzweig (1913–2006) was an undergraduate music student at the Faculty of Music, he ran an ad in the student newspaper The Varsity in 1934 soliciting players for an orchestra. This led to the creation of the first University of Toronto Symphony Orchestra, which gave its debut concert on March 9, 1935, featuring Schubert’s “Unfinished” Symphony and other works. Despite sharing the same name, however, Weinzweig’s orchestra was not really a direct predecessor of the current UTSO. Weinzweig’s UTSO was run by the university’s Student Administrative Council rather than the Faculty of Music, and was more of a community orchestra than a professional training orchestra. Weinzweig’s connection with the UTSO ceased when he left Toronto for graduate studies at the Eastman School of Music in 1937. But the UTSO which he had founded continued on until the 1960s. It was conducted over the years by, among others, Victor Feldbrill (1943; more about him later), John Reymes-King (1944; he later founded the music program at the University of Alberta and received the first PhD in music from the University of Toronto in 1950), Hans Gruber (1945–48; later conductor of the Victoria SO), Harold Neal (1949; later conductor of the Brantford SO); Lee Hepner (1949–50; later founding conductor of the Edmonton SO); Elmer Iseler (1950; later a renowned choral conductor); Keith Girard (1952; later a flute player in the TSO); Robert Rosevear (mid-1950s; the orchestra often appeared with the University of Toronto Chorus under Richard Johnston during these years), Milton Barnes (1963; he had been a composition pupil of Weinzweig); Albert-Josef Schardl (1963–64), and Tibor Polgar (1965–66). Gruber was a student when he conducted the UTSO, and Girard was a recent graduate, while both Rosevear and Johnston were faculty members. Schardl (1930–2018) was a US violinist, conductor, and composer of Austrian parentage. A self-proclaimed “genius,” he claimed to be fluent in seven languages, and was working for Berlitz in Toronto at the time. 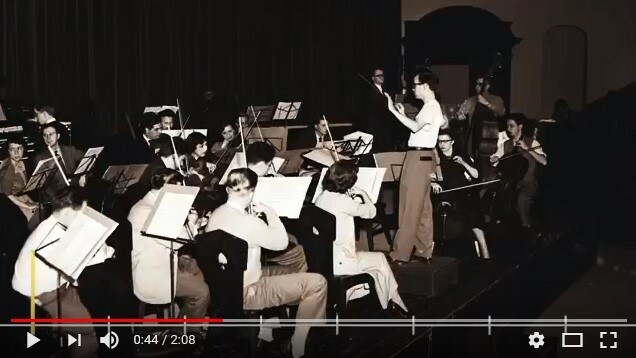 In the recent University of Toronto promotional video there is a brief image at 44 seconds (blink and you will miss it) of an orchestra – shown in the still image above. This is the University of Toronto Symphony Orchestra, with conductor Keith Girard (MusBac 1951), in March 1952. The source of this image is the U of T Archives Image Bank, available online here. The first UTSO premiered new works by Canadian composers on occasion, including Talivaldis Kenins, Alfred Kunz, Richard Johnston, and Charles Wilson. Student musicians often appeared as soloists with the orchestra, e.g. the pianist George Crum (who became the first music director of the National Ballet of Canada) played the opening movement of the Schumann Piano Concerto and some solo works on February 20, 1946. This UTSO ceased operations shortly before the Faculty of Music took over the UTSO name for its student orchestra in January 1969. The Hart House Orchestra, founded in 1976, is similar to the Weinzweig UTSO in that it has no official affiliation with the Faculty of Music, and its 80 to 90 musicians are chosen by audition from the broader U of T community. The orchestra typically performs three concerts in Hart House each season, and one concert on tour. To celebrate its fortieth anniversary season and the Sesquicentennial of Confederation, the orchestra performed in Carnegie Hall in February 2017. An earlier Hart House Orchestra performed from 1954 to 1971 under the conductor Boyd Neel. It was a professional chamber orchestra of varying size and quality which made a number of recordings and toured widely. Meanwhile, back in 1919, the university had taken control of the Toronto Conservatory of Music (which became the Royal Conservatory of Music in 1947). Instead of a loose affiliation, which had been the arrangement since 1896, this merger resulted in the University of Toronto assuming the Conservatory’s assets and overseeing its operations, while continuing to support the Faculty of Music as well. This union between the Conservatory and the University of Toronto was not always a happy one, but it lasted for 72 years. In 1924 a new student orchestra started up at the Conservatory under Luigi von Kunits, a Viennese-born conductor, composer, and violinist who had become the conductor of the revived TSO in 1922. Also in 1924, a junior orchestra class was started up at the Conservatory under the violist Milton Blackstone, to prepare younger students for the more advanced orchestra. The baton for the senior student orchestra passed on from Kunits to the violinist Donald Heins in 1930, and then to Ettore Mazzoleni in 1934. Mazzoleni led the Royal Conservatory Orchestra for over 30 years. He was born in Switzerland in 1905, moved to England as a boy, and was educated at Oxford and the Royal College of Music. He immigrated to Toronto in 1929 to teach at Upper Canada College, joined the Conservatory teaching staff in 1932, and married Ernest MacMillan’s sister Winnifred in 1933. His vision for the Conservatory orchestra was that it should not only provide music students with professional training and an introduction to the great works of the symphonic literature, but also allow Conservatory composition students and other young composers a chance to hear their orchestral scores in live performance. And so in addition to the standard repertoire, Mazzoleni introduced a great deal of new Canadian music by composers such as Brian Cherney, Harry Freedman, Richard Johnston, Paul McIntyre, Oskar Morawetz, Clermont Pépin, and Harry Somers. Boyd Neel also conducted the Conservatory’s student orchestra on occasion starting in 1956. Neel had arrived in Toronto from England in 1953 to become the Dean of the Royal Conservatory of Music (and, as noted above, he started up the Hart House Orchestra in 1954). Mazzoleni and Neel, together with Sir Ernest MacMillan, shared the orchestral conducting duties for the week-long festival in March 1964 that marked the official opening of the Edward Johnson Building (EJB). The 815-seat MacMillan Theatre in the EJB became the fine new venue for the concerts of the student orchestra. After Mazzoleni’s death in a traffic accident in 1968, the Czech conductor Karel Ančerl led the Conservatory orchestra for the first term of the 1968–69 season during his brief stint as an artist-in-residence at the Faculty of Music. Ančerl had just recently immigrated to Toronto following the 1968 Soviet invasion of Czechoslovakia. He led the last performance of the Royal Conservatory Symphony Orchestra on December 6, 1968. In 1969 he assumed duties as the conductor of the TSO, a position which he held until his death in 1973. 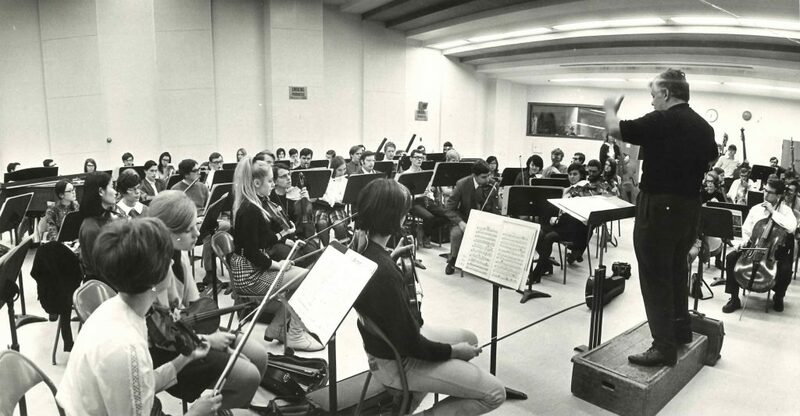 Victor Feldbrill conducting UTSO rehearsal, early 1970s. The renamed University of Toronto Symphony Orchestra gave its first concert under its new conductor, Victor Feldbrill, on January 17, 1969. The program included works by Weber, Weinzweig, and Mahler in the first half and Shostakovich’s Fifth Symphony after intermission. The UTSO and Feldbrill then toured to Montreal and Ottawa with this program. The orchestra now consisted entirely of students at the Faculty of Music; gone were the days of teachers and community members filling out the ranks at concert time. Feldbrill had conducted the earlier UTSO on February 25, 1943 as an 18-year-old secondary school student. He went on to study music at the U of T, graduating with an Artist’s Diploma in 1949. More recently, he had just finished a ten-year stint as the principal conductor of the Winnipeg Symphony. He had lots of experience working with young musicians, having conducted the National Youth Orchestra of Canada on numerous occasions during the 1960s. He was named the conductor-in-residence at the U of T in 1972, and was also founding conductor of the Toronto Symphony Youth Orchestra from 1974 to 1978. The UTSO gave three concerts per season under Feldbrill and played for two Faculty of Music opera productions each year, including demanding works such as Humphrey Searle’s Hamlet in February 1969 (the North American premiere, with the composer present), Stravinsky’s The Rake’s Progress in December 1971, Verdi’s Falstaff in January 1973, and Janáček’s Káťa Kabanová in March 1977. This logo was introduced when the Royal Conservatory Orchestra was renamed the University of Toronto Symphony Orchestra in January 1969 and for years it appeared on the cover of the concert programs. I played in the first violin section of the UTSO for the 1979–80 season when I began my graduate studies in musicology at the U of T. The concerts under Feldbrill were all memorable experiences for me. The first featured the superb Passacaglia and Fugue by Harry Somers, Ravel’s Piano Concerto in G with Stella Ng as soloist, and Beethoven’s Fifth Symphony. We also did Mahler’s First Symphony that season, Richard Strauss’s Till Eulenspiegel, and the Marimba Concertino by Paul Creston with soloist Beverley Johnston (who is now, like me, a faculty member at U of T). Two composers appeared as guest conductors of their music that season, and how contrasted they were! The Toronto musician Ben McPeek led the orchestra on December 1, 1979 in a performance of selections of his music, including his “Commercial” Overture, based on jingles he had written for radio and television ads, such as his unforgettable signature tune for TD Bank (“To-RON-to Do-MIN-ion”). McPeek was known as the “Jingles King” and wrote over 2,000 catchy tunes during his short career until his untimely death from cancer in 1981 at the age of 46. By way of complete contrast, the Quebec composer, conductor and new music advocate Serge Garant appeared for a performance of his challenging work Phrases II (1968) on 12 April 1980, in which the orchestral musicians speak (phrases from the writings of Che Guevara) as well as play. Garant and Feldbrill co-conducted the work, in which the orchestra is split into two sub-orchestras side by side on stage. Among the many highlights of Feldbrill’s years with the UTSO were the world premiere of R. Murray Schafer’s epic work Divan i Shams i Tabriz for seven singers, orchestra, electronic organ, and four-channel tape sounds on April 8, 1972; a performance of Weinzweig’s Dummiyah on March 10, 1973 to celebrate the composer’s 60th birthday (repeated on March 18 for a concert in Ottawa at the National Arts Centre); Beethoven’s Ninth Symphony – always a significant event in the life of an orchestra – on March 9, 1975; and Stravinsky’s The Rite of Spring – a demanding work for a student orchestra –on March 6, 1976. Outstanding student soloists who performed under Feldbrill included the cellist Janet Horvath in Tchaikovsky’s Roccoco Variations (March 10, 1973) and the violist Steven Dann playing the Walton Viola Concerto (October 25, 1975). 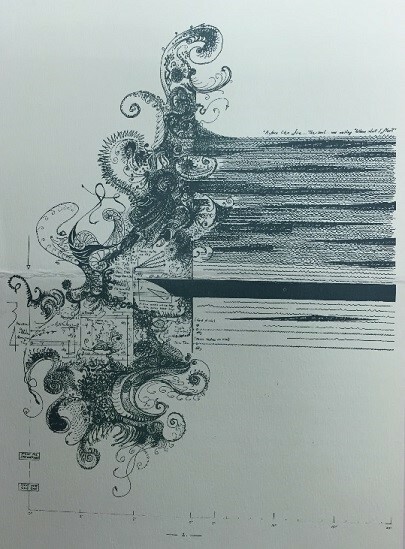 This opening page of Schafer’s score for Divan i Shams i Tabriz is a visual representation of the tape sounds; it was included as an insert in the program for the UTSO world premiere of the work in 1972. To mark the end of Feldbrill’s 14-year term as the UTSO resident conductor, he led a performance of Mahler’s Symphony No. 2 on April 3, 1982 – the day before his 58th birthday. The program noted that 166 students who had played under Feldbrill’s direction in the UTSO went on to join professional orchestras in Canada, the USA, and Europe. It also listed all of the repertoire the UTSO had performed under his direction: 122 different works by 59 composers, with four world premieres and four Canadian premieres. Feldbrill returned to the UTSO several times over the years as a guest conductor, e.g. a concert in 1999 to mark the 50th anniversary of his graduation from the U of T and, most recently, a concert on April 6, 2013 (two days after his 89th birthday) featuring Weinzweig’s Symphonic Ode to mark the centennial of the composer’s birth (Feldbrill had programmed this work in his first concert with the UTSO in 1969), with Tchaikovsky’s Serenade for Strings and Dvořák’s Symphony No. 8. The 2013 concert also marked the 70th anniversary of Feldbrill’s conducting debut with the earlier UTSO in 1943. After Feldbrill’s departure, the UTSO played under a series of guest conductors for three seasons, including Mario Bernardi, Kazuhiro Koizumi, and Otto-Werner Mueller. Canadian works programmed included the Suite for Harp and Chamber Orchestra by Harry Somers with harpist Laura Stephenson on January 21, 1984, and the Concerto for Five Percussionists and Orchestra by Talivaldis Kenins on March 31, 1984. The Kenins work was a premiere to mark his retirement from the Faculty of Music; the soloists were five student performers from the studio of Russell Hartenberger. 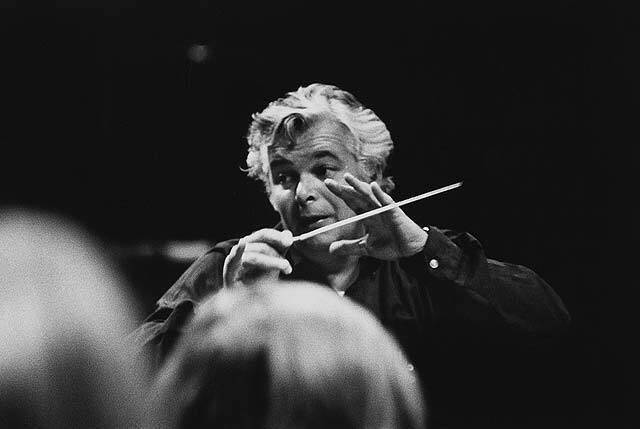 The Swiss conductor Michel Tabachnik became the UTSO’s regular conductor in 1985 and held the position until 1991. He was no stranger to Toronto, as he had conducted a number of Canadian Opera Company productions earlier in the 1980s. In addition to the standard repertoire (with a notable emphasis on French music), Tabachnik programmed contemporary works by Messiaen, Varèse, and Xenakis, as well as Canadian compositions by Clermont Pépin (Symphony No. 3 “Quasars”) and U of T composers Lothar Klein (Design for percussion and orchestra) and Oskar Morawetz (Passacaglia on a Bach Chorale). Performances by the UTSO under Tabachnik were recorded for later broadcast on radio station CJRT. Tabachnik’s final concert with the UTSO was given in January 1991. The Quebec conductor Pierre Hétu stepped in as a guest conductor for the last UTSO concert of that season, after which he was chosen to be the resident conductor of the UTSO. Incidentally, Tabachnik later gained notoriety when his links to the doomsday cult Order of the Solar Temple were the subject of a sensational court trial in France in 2001, but he was acquitted by the court and resumed his prominent international conducting career. Hétu was born and educated in Montreal and had also studied conducting under Louis Fourestier at the Paris Conservatoire. He was the artistic director of the Edmonton SO from 1973 to 1980, and had guest conducted across Canada and in Europe. For the final concert of his first complete season with the UTSO (on April 10, 1992), Hétu programmed Weinzweig’s Symphonic Ode and Shostakovich’s Fifth Symphony, both of which had featured in the very first concert given by the orchestra under Feldbrill in 1969. Other Canadian works heard during Hétu’s brief term as resident conductor included Lothar Klein’s Festival Partita and Chan Ka Nin’s Ecstasy. Hétu was not able to appear to conduct a scheduled program of works by Beethoven, Liszt, and Kodály on January 21, 1994 due to ill health, and stepped down from his position at U of T. He had to drastically curtail his conducting appearances from that point until his death from cancer in 1998. Dwight Bennett, a U of T alumnus who had studied conducting with both Ančerl and Feldbrill, stepped in to take Hétu’s place for the last two concerts of the 1993–94 season, and then was named resident conductor. Bennett’s ambitious first complete season with the UTSO included performances of Berlioz’s Symphonie fantastique,Beethoven’s Ninth Symphony, and Schafer’s iconoclastic Son of Heldenleben. His second season opened with the premiere of Danseries: Three Orchestral Dances by Lothar Klein and concluded on March 30, 1996 with a demanding program that featured Schoenberg’s Variations for Orchestra, Op. 31 and Mahler’s Fifth Symphony, both works new to the UTSO. Continuing this trend, his third season concluded on April 5, 1997 with an even more demanding program: Varèse’s Ionisation, Ravel’s Bolero, and Stravinsky’s The Rite of Spring. Having brought the orchestra to that summit of the orchestral repertoire, Bennett stepped down from his role with the UTSO to take up concurrent positions in Tel Aviv and Kyiv. The next two seasons (1997–98 and 1998–99) again featured a series of guest conductors, including Feldbrill, Peter Oundjian (at the beginning of his conducting career, following his retirement from the Tokyo String Quartet), Daniel Swift, and two men who would later become resident conductors of the UTSO, Raffi Armenian and Uri Mayer. Works performed during those two seasons included Beethoven’s Fifth Symphony, Berlioz’s Symphonie fantastique, Brahms’s Symphony No. 1, Schumann’s Symphony No. 4, and Tchaikovsky’s Symphony No. 5. Student soloists included the violinist Elissa Lee in Bartók’s Violin Concerto No. 2 (October 25, 1997), cellist Rachel Mercer in Bloch’s Schelomo (February 7, 1998), soprano Measha Brueggergosman in Berlioz’s Les nuits d’été (January 23, 1999), and violinist Shane Kim in Chausson’s Poème (November 28, 1998). Doreen Rao, the director of choral activities at the U of T, led the UTSO and the university choirs in the premiere performance of faculty member Walter Buczynski’s A Ballad of Peace on April 4, 1998 (Buczynski retired the next year). Raffi Armenian was chosen to be the new resident conductor of the UTSO starting with the 1999–2000 season. He brought a wealth of experience with both professional and student orchestras to the position. 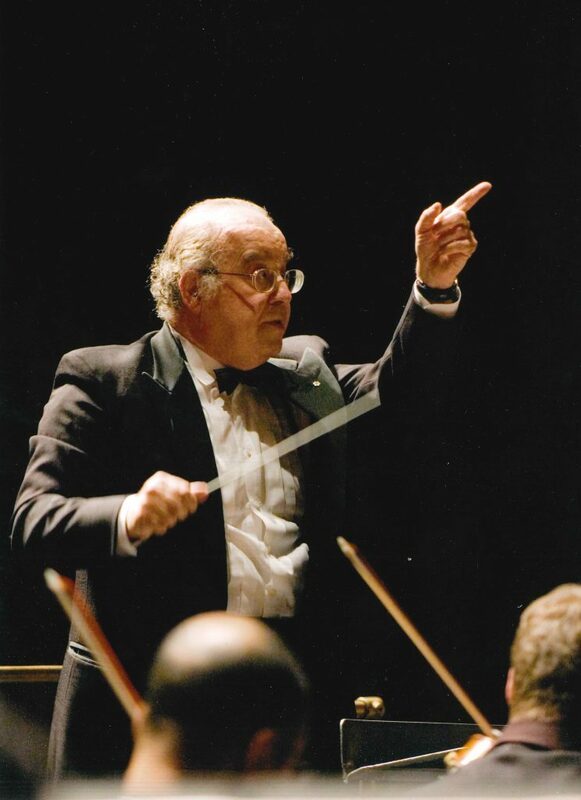 He had served from 1971 to 1993 as the conductor of the Kitchener-Waterloo Symphony, and he conducted the student orchestra at the Conservatoire de Montréal from 1981 to 2013, holding the UTSO position concurrently with that role. He also had directed the orchestra and taught conducting at the Hochschüle für Musik in Graz from 1997 to 1999. With residences in Vienna, Montreal, and Toronto, Armenian and his wife, the conductor Agnes Grossmann, enjoyed busy, cosmopolitan lives. Armenian conducted the UTSO from 1999 to 2008, stepping down to become the director of the Conservatoire in Montreal, a position he held until 2011. He continued to teach conducting and lead the orchestra at the Conservatoire in Montreal until his retirement in 2013. Armenian brought the UTSO and l’Orchestre symphonique du Conservatoire de Montréal together on three occasions for memorable concerts in MacMillan Theatre. On March 6, 2002 the combined student orchestras performed Mahler’s Sixth Symphony; on February 4, 2006 they played Stravinsky’s The Rite of Spring and Shostakovich’s Symphony No. 10; and on December 8, 2007 they performed Berg’s Three Pieces for Orchestra, Op. 6, Ravel’s brilliant orchestration of his “Alborada del gracioso” from Miroirs, and Strauss’s Ein Heldenleben. With the exception of the Stravinsky, these works were all new to the UTSO. Armenian passed the baton to his wife on three occasions: Grossmann led the UTSO in performances of Bruckner’s Symphony No. 4 on 7 April 2001, Dvořák’s Symphony No. 9 on October 13, 2001 and Mahler’s Symphony No. 1 on March 30, 2007. The repertoire under Armenian’s direction ranged from Bach to Schafer. There was plenty of Wagner, with orchestral excerpts from Lohengrin, the Ring, and Parsifal, as well as the Wesendonck Lieder and the ever popular overture to Die Meistersinger. In addition to Mahler’s Symphony No. 6 with the Conservatoire orchestra, he also led the UTSO in a performance of Mahler’s Symphony No. 3 on April 8, 2000. Those two performances marked the completion of the UTSO’s traversal of the first six symphonies by Mahler. Armenian featured faculty members as soloists on occasion, e.g. Lorand Fenyves in Bartók’s Violin Concerto No. 2 (October 14, 2000) and Scott St. John and Shauna Rolston in the Double Concerto by Brahms (December 8, 2004). Student soloists included Amanda Goodburn in the Brahms Violin Concerto (April 7, 2004), Min-Jeong Koh in Prokofiev’s Violin Concerto No. 1 (April 9, 2005) and Joël Cormier in Robert Kurka’s Marimba Concerto (December 9, 2005). The amount of Canadian repertoire performed by the UTSO diminished during Armenian’s term, but there was one notable premiere. The five-man percussion ensemble Nexus, artists-in-residence of the Faculty of Music at the time, gave the first performance of Schafer’s Shadowman, which was commissioned for Nexus and the UTSO by Michael Koerner. Writing of the premiere in The Globe and Mail (February 5, 2001, p. R3), Ken Winters noted that the dramatic and theatrical work was “enormously diverting” and “a natural [work] for a superior university orchestra and a visiting virtuoso percussion ensemble”. The performance was recorded by the CBC and later broadcast on the CBC Radio Two show Two New Hours. The growth of the graduate program in conducting at the University of Toronto under Armenian led to frequent appearances with the UTSO by student conductors, a practice that continued and indeed increased under his successors, David Briskin and Uri Mayer. This even led to the creation of a new orchestra, when two of Mayer’s graduate conducting students, Chad Heltzel and Lorenzo Guggenheim, created the Campus Philharmonic Orchestra, which gave is first concert on December 6, 2018. This orchestra, which is for non-music majors and other members of the campus community, is in a sense the successor to the original Weinzweig UTSO, which had been founded over 80 years earlier. Curiously enough, the first concerts of both Weinzweig’s UTSO and the Campus Philharmonic Orchestra featured Schubert’s “Unfinished” Symphony, as if to affirm the link between the two ensembles. The US musician David Briskin was appointed as the director of orchestral studies and conductor of the UTSO in July 2008. Briskin had been living in New York City for 23 years before moving to Toronto in 2006 to become the music director and principal conductor of the National Ballet of Canada. He maintained his position with the National Ballet and also kept up a busy schedule of international appearances, while adding the UTSO position to his duties. Due to prior commitments he was only able to lead the first two of the four UTSO concerts in his first season; Alain Trudel and Ivars Taurins led the final two concerts that year. In his second season, Briskin combined his two orchestras, the UTSO and the National Ballet Orchestra, for a performance on March 28, 2010 that included Symphonie fantastique by Berlioz, a perennial favorite with UTSO conductors. A highlight of the third season was the performance of Beethoven’s Ninth Symphony on February 5, 2011 to welcome Don McLean as the new Dean of the Faculty of Music. U of T composers Chan Ka Nin, Alexander Rapoport, and Norbert Palej also wrote celebratory fanfares for the occasion. In Briskin’s fourth season, Jamie Kruspe appeared as the soloist in Beethoven’s Violin Concerto, and the next season his sister Emily Kruspe was soloist in the Sibelius Violin Concerto (their father is the recently retired U of T faculty member John Kruspe). Other major works performed under Briskin included Bartók’s Concerto for Orchestra, Borodin’s Symphony No. 2, Mahler’s Symphony No. 1, and the Mussorgsky/Ravel Pictures at an Exhibition. The UTSO also became a regular participant in the U of T’s New Music Festival, held each January. On January 25, 2014, for instance, the visiting British composer Gabriel Prokofiev’s Concerto for Turntables and Orchestra and his Spheres for violin and orchestra were played in between music from the ballets Cinderella and Romeo and Juliet by his grandfather, Sergei Prokofiev. Also in 2014, the UTSO appeared in concert with the University of Toronto Jazz Orchestra under its director Gordon Foote. In the first half, the UTSO played jazz-inspired works by Bernstein, Milhaud, and Gershwin, with the UTJO appearing in the second half. In Briskin’s seventh and final season with the UTSO, he appeared in just two concerts, conducting Tchaikovsky’s Fifth Symphony and Stravinsky’s Petrouchka. The other two concerts that season were conducted by the acting director of orchestral studies that year, Uri Mayer. Mayer brought to the position a lengthy professional career as a violist and conductor. He had led the Edmonton Symphony Orchestra from 1981 to 1994 (as successor to Pierre Hétu), and had taught at the University of Michigan, Rice University, McGill University, and the Glenn Gould School. He had made many international appearances as a guest conductor and also had appeared with the UTSO in that capacity in the past. 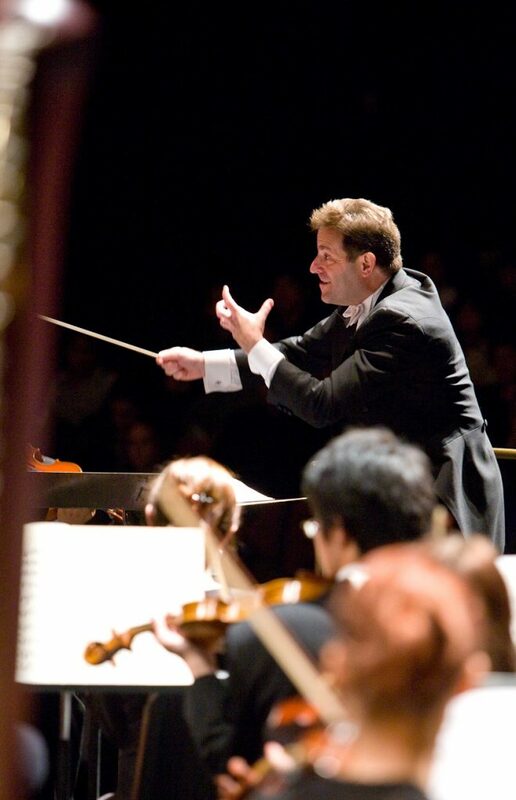 After a year as acting director, Mayer became the director of orchestral studies and conductor of the UTSO beginning with the 2015–16 season. Even more than Briskin and Armenian, Mayer has given student conductors abundant opportunities to conduct the UTSO. The UTSO concert on November 21, 2015 was entirely led by three student conductors, and most concerts since then have included at least one appearance by a student conductor. Mayer’s thoughtful programming has included works new to the UTSO, such as Lutoslawski’s Concerto for Orchestra (December 5, 2015), Zemlinsky’s Sinfonietta (December 8, 2017), Harry Freedman’s Suite from the ballet Oiseaux exotiques (April 7, 2018), and Tchaikovsky’s First Symphony (December 7, 2018), as well as longtime UTSO favorites such as the Symphonie fantastique, Stravinsky’s Firebird, and Shostakovich’s Fifth Symphony. Mayer has also programmed music by U of T faculty composers, such as Norbert Palej’s Symphony No. 1 “Gulag” (December 10, 2016) and Christos Hatzis’s The Isle is Full of Noises (October 5, 2017, on a program with Debussy’s La mer, which inspired Hatzis’s work). The UTSO has many wonderful performances in its past, and has fostered the career of hundreds of orchestral musicians and a good many chamber musicians and soloists as well. Looking ahead, Mayer plans to conclude the current season with a performance of Stravinsky’s The Rite of Spring on April 6, 2019 – marking the fourth time that the orchestra will have tackled this challenging work. Celebrating its fiftieth anniversary in January 2019, the UTSO continues to provide invaluable professional training for young instrumentalists and richly enjoyable concerts for the supportive audience members who turn out to hear the orchestra each season. Long may it continue to do so. NB: Past UTSO performances are being digitized and put online by the University of Toronto Music Library as part of its Faculty Events Database. Thanks to librarians Karen Wiseman and James Mason for their assistance with the research for this article, and to John Beckwith for his helpful comments on it.